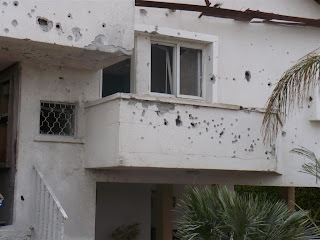 Day 5 of the Gaza war, Wednesday Dec. 31 2008 -- Daily sticky post, constantly updated. Additional New posts from today can be found below this post. As a general rule we will try and keep operational details to a minimum, that includes troop movements and the exact location of rocket hits. If items are reported in the Main Stream Israeli Media we will report them as well. 11:59 PM None injured in rocket attack on Beer Sheva. This concludes Day 5 of Gaza's War on Israel. LiveBlogging will resume early tomorrow morning or earlier, depending on the severity or news-worthiness of what's going on. I would like to take this opportunity to thank the Muqata Staff who has been tirelessly updating the blog and twitter feeds (and to our families who put up with this). 11:56 PM Rescue personnel continue the search for wounded in Beer Sheva...after several rocekt strikes. 11:43 PM While some Israeli news sites are reporting exact locations of where rockets land, the Muqata blog will continue to only provide approximate locations of actual rocket strikes. Palestinians are monitoring the Israeli websites to determine exactly where the rockets have landed, to help calibrate their next launches. 11:42 PM Reports of 3-4 explosions in Beer Sheva and surrounding areas. 11:41 PM Explosion heard in Beer Sheva. 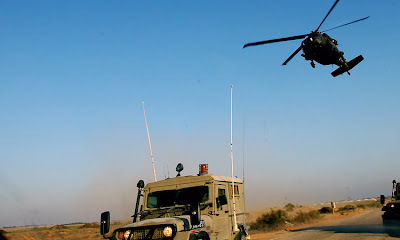 Emergency Forces Responding. 11:39 PM Air Raid Sirens in Western Negev and Beer Sheva. 11:30 PM Explosion heard in Ashdod was New Year "fireworks" -- no injuries/damage. 11:29 PM Explosions heard in Ashdod and Western Negev. Emergency Personnel resonding. 11:19 PM Gazans report that IAF warplanes have been destroying targets in Gaza over the past hour, hitting rocket manufacturing buildings in Han Yunis, Jebaliya, and Beit Lahiya. 11:18 PM Palestinians throw molotov cocktail at Jewish motorist in Shomron/West Bank. The car caught fire and is going up in flames. The motorist managed to escape his car before it was consumed by fire. Jameel adds: That could have been me -- I drove past that exact location an hour ago. 10:45 PM IDF Spokesman releases video of the mosque bombing a few hours earlier. 10:44 PMOngoing rockets landing in Netivot, Nachal Oz, Ashkelon, Sederot and Beer Sheva over the past hour. No reports of injuries -- the vast majority of the rockets landed in open areas. 8:57 PM Security sources claim that word of a ground attack on Friday is pure speculation. 8:55 PM Reports that IDF has hit 25 strategic targets in Gaza since this morning. 8:54 PM Command center of the People's Front terror group destroy by Air Force. 8:19 PM Channel 2 News reports that ground troops will go in on Friday. 7:38 PM Channel 1 Israel TV reports that an IDF Gunboat opened fire on 2 suspicious rubber dinghies near Taba (Egypt), Red Sea (Eilat). 7:28 PM Molotov cocktail thrown at Jewish motorist in the Shomron (West Bank area). No injuries. 7:09 PM Air Raid Sirens in Western Negev communities. 7:04 PM Gaza war goes global. Arabs shoot Israelis in a Denmark shopping mall -2 wounded. Most reports are indicating that the shooters were Palestinians. 6:47 PM IDF spokesman announces that the Gazan Mosque which was attacked today was also used as a launching site for rockets against Israel. 6:42 PM War Update - Day 5. 6:02 PM Air Raid Sirens in the Northern 40 kilometer zone. 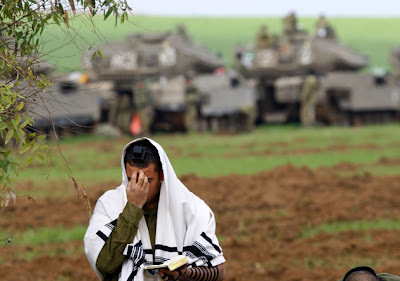 5:50 PM IDF Tank solider at Gaza's border takes a quick break to pray. 5:42 PM Reports that IAF jets bomb a Gaza Mosque. Reports of wounded. The mosque was used for storing Rockets to be used against Israel. 5:30 PM Watch this short 15 second video clip. 15 seconds is all you have from the start of the "Code Red" or air raid siren if you're in the 10 kilometer zone around Gaza...to run to a bomb shelter. 5:23 PM Jameel's updated map (In English) of the different danger zones around Gaza. 5:14PM Sirens in Be'er Sheva. 5:05PM Israeli family shot at by Palestinian in Denmark. Reports of 1-2 injured. 4:50PM In a surprising turn of events, major Pro-Israel protest at Tel-Aviv University, not known for its nationalist sympathies. 4:41PM Rockets fired in the direction of Ashkelon. 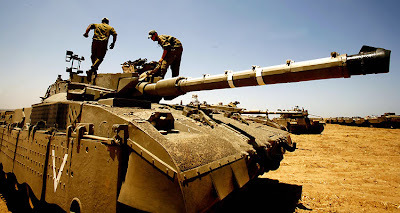 4:37 PM Unconfirmed rumors that Israel is giving large rewards to Gaza residents that give information that leads to the assassination of Hamas commanders. 4:29 PM Rocket lands in open areas in the Eshkol region. 4:23 PM Yuval Diskin, head of the G.S.S. (Shabak) claims Hamas terrorists are dressing up as doctors. 4:15 PM Reports coming in that Hamas is ready to hear options for a cease fire. 4:14 PM A total of 45 rockets today. 3:41PM Head of Egyptian Intelligence supported the operation in Gaza as a way to get Hamas out and "end the suffering in Gaza". 3:38 PM 4 rockets in the Eshkol Region, no injuries. 3:37PM Rocket falls near S'dot Negev, no injuries. 3:34 PM Air Force attacking the center of Gaza. 3:12 PM More rockets on the way. Mada (Magen David Adom) has raised its alert level countrywide. This is the first time ever in the history of the country. 2:27 PM 4 Rockets hitting Ofakim. 2:01 PM Jerusalem Post has publicized that one of the rockets earlier today hit Route 6. (On a lighter note, Hamas may go bankrupt once Derech Eretz starts fining them for littering on their highway). 1:58 PM Police arrest 2 individuals in Jerusalem's Old City trying to force Arab vendors to stay closed as part of a Gaza protest. 1:37 PM Kasam rocket lands in S'dot Negev, damage reported but no injuries. 1:35 PM 2 Palestinian infants injured serious in Gaza brought into Israel for medical care. 1:34 PM Schools in Gaza area closed tomorrow also, most likely for the rest of the week. 1:33 PM 2 rockets over Netivot. Additionally rockets are packed with ball bearings that spread up to 100M from rocket strike. 12:35PM The Security forces are claiming they have totally destroyed all the laboratories for the construction of rockets. 12:34 PM Rockets and mortar fire over Sha'ar HaNegev and Sderot, also to the North of the Strip. 12:27 PM Reports that Hezbollah is trying to get larger longer range missiles to Gaza. The Air Force has succeeded in destroying some in tunnels under Rafiach. 12:23 PM Sirens in Ashkelon. At least 2-3 explosions heard. 12:09 PM Reports of rockets over Ofakim. 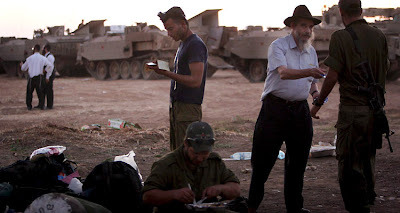 12:07 PM Home Front command has forbidden all gatherings in Be'er Sheva. 12:05 PM Head of General Security Services (ShaBaK) states that Hamas terrorists are hiding in hospitals in Gaza, a clear violation of the Geneva convention. 12:00 PM A total of 30 rockets fired this morning. 2 lightly wounded. 11:56 AM No injuries reported from 11:52 barrage. 11:55 AM Sirens in Western Negev Communities. 11:52 AM Rockets land in Western Negev area and Sederot. 11:49 AM IDF reports that Palestinians have started firing their longer range missiles from within heavily populated areas in Gaza, making it more challenging for IAF helicopters to hit them. Gedera area gets hit by Grad missile. No reports of injuries. 11:39 AM Alarms in Be'er Sheva. 11:37 AM Reports of rocket fire over Ofakim. 11:32 AM President Peres was in Ashkelon at the time of rocket hits, spent it in one of the bunkers in the city. 11:20 AM We reported yesterday about the pet dog of a firefighter wounded in a rocket attack in Sderot. Unfortunately the dog has died. 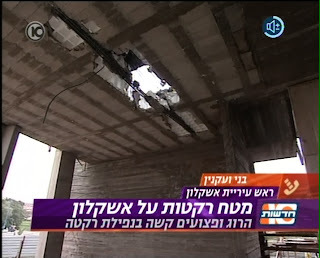 11:15 AM Pictures of the roof of high school hit by Grad/Katyusha rocket. The class room was empty due to school cancellation. 11:13 AM Two women being treated for shock in Ashkelon. 11:04 AM A second wounded individual in Ashkelon. 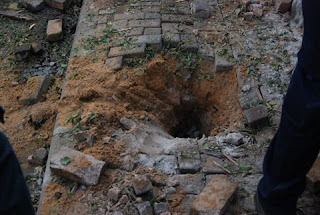 Another rocket lands in area. 11:02 AM Unconfirmed reports of rocket near Gedera. 11:01 AM Reports of rocket landing in Yavneh. Update: Mayor of Yavneh denies this. 10:51 AM Another explosion heard near Ashkelon. 10:50 AM Rocket lands in Ashdod area. 10:47AM One woman injured lightly in Ashkelon. 3 rockets. 10:45 AM Under pouring rain, Sirens in Sderot and Ashkelon. 10:35 AM 2 rockets reported in Ashkelon. 10:33 AM Sirens in Ashkelon. 8 people treated for shock in Be'er Sheva. 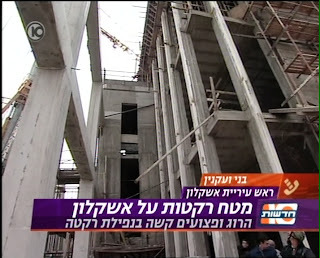 10:16 AM Fire breaks out from rocket hit on hotel in Be'er Sheva. No injuries. UPDATE: The fire unrelated to rocket. 10:13 AM 40 Hamas sites hit over night in Gaza. Operations against the tunnel network under the Philadelphia route. 10:12 AM A total of 20 rockets fired into Israel this morning so far. 10:09 AM Grad/Katyusha lands in Be'er Sheva, no report of injuries. 10:06 AM Sirens at this moment in Be'er Sheva. 10:00 AM Rocket lands North East of Lachish in the Yoav region, ~40 Km. from Gaza. 9:57 AM Sirens in S'derot. 9:56 AM Problems with sirens in Be'er Sheva. 9:52 AM Helicopters hunting rocket launching sites over Gaza. Navy firing artillery at launch sites. 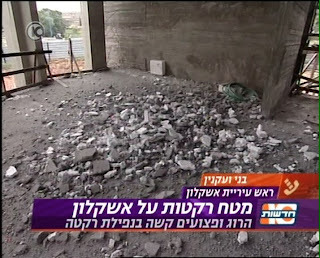 9:50 AM 1 of the Grad/Katyusha rockets in Be'er Sheva exploded in an empty classroom. 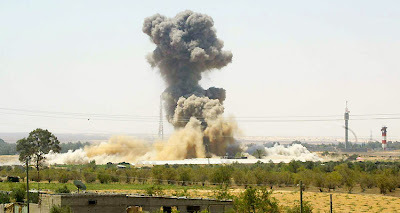 9:49 AM Office of Ismail Haniyah hit by Air Force. 9:46 AM Barrage of rockets over Be'er Sheva, reports of 4 rockets falling in the city. Also Chof Ashkelon and Eshkol. 9:42 AM Sirens also in Kiryat Gat. 9:40 AM A rocket that fell earlier in the Eshkol region caused damaged to cars in the area, no injuries. 9:33 AM 3 Rockets land in and around Ofakim. Sirens in Yavneh. 9:30 AM Alarms in Ofakim and Be'er Sheva. 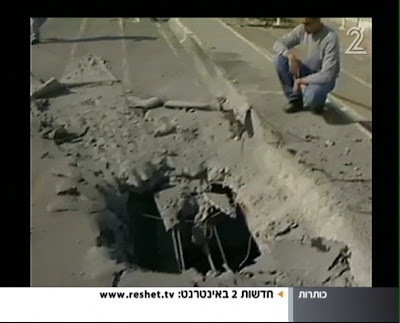 At least one rocket landed in Ofakim, no reports of injuries. 8:30 AM Rockets land in Be'er Sheva. Brother of Shas Minister of Religious Affairs Yitzchak Cohen injured in rocket attack in Ashkelon. Defense Minister Barak weighing cease fire. PM Olmert against. 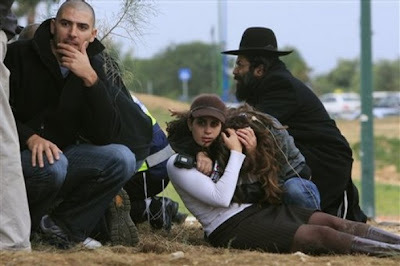 6:04 AM (IsraelNN.com) Classes in Be'er Sheva, nearby Kibbutz Hatzerim and at Ben Gurion University have been cancelled for Wednesday following Tuesday night's Grad Katyusha attacks in the Negev capital. 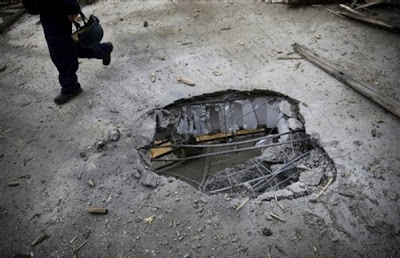 5:45 AM Israel strikes smuggling tunnels and Hamas office. 5:43 AM A quiet night in Israel, but not so much in Gaza. Air Force and Navy units hit multiple targets throughout the Gaza Strip. Reports of hits on houses of Hamas leaders, government buildings and the Gaza Port. Olmert rejects any chance for a cease fire at this point. 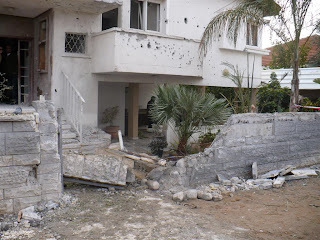 Day 4 of the Gaza war, Tuesday, Dec 30th 2008 -- Daily sticky post, constantly updated. 12:03 AM Jameel here signing off. Thanks again to the wonderful Muqata staff who has been liveblogging around the clock. We hope to continue early tomorrow morning (or during the night if things get crazy). This is Jameel @ The Muqata, reporting from somewhere in the hills of Samaria -- wishing safety and security to our IDF soldiers and Israel's civilians. 11:44 PM Tonight, a tourist from Chicago was attacked by an Arab mob in Nazereth -- they mistakenly assumed he was "Jewish". Police rescused the tourist who did not require medical assistance. (source in Hebrew) The police have opened an investigation to locate the attackers. 11:33 PM IAF warplanes destroy underground Grad/Katyusha launcher in Gaza which was used for tonight's rocket launch against Be'er Sheva. 11:24 PM Over 34 shock victims tonight as a result of the Grad Missile (Katysuha) that hit a Beer Sheva kindergarten tonight. Two Kassam rockets launched at Western Negev -- no injuries or damage. 11:14 PM Jameel here for a bit more -- thanks Litvshe for some awesome reporting today! Many of the Jewish residents from Gaza who were removed by the Israeli Government during the "Disengagement" were relocated to temporary housing in Nitzan (3 years in temporary housing with no solution is another issue). 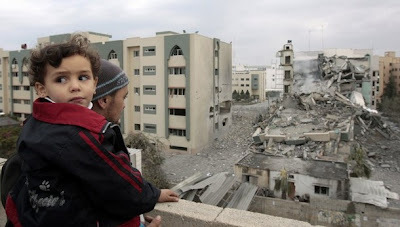 The problem is their temporary housing is made totally of sheetrock, and there are no shelters or concrete walls in case of the falling rockets from Gaza. 11:00 PM This is Litvshe signing off for the night. I'll be back in the morning. 10:50 PM The cell that launched the rockets at Be'er Sheva has been hit by Air Force fire. 10:28 PM One person lightly wounded by shrapnel in Ashkelon. 10:18 PM Reshet B radio reports 9 people treated for shock in Be'er Sheva, once child taken to hospital. 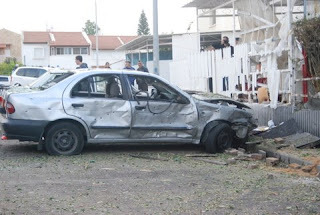 10:15 PM Several cars damaged in Ashkelon several cars damaged from rocket fire, 2 people treated for shock. 9:50 PM President Bush: "There is no point in a ceasefire just for the sake of having a ceasefire". 9:48 PM Unconfirmed reports of an explosion near Yavneh. 9:45 PM Reports of rockets falling in Be'er Sheva and Ashkelon. 9:42 PM Another barrage of rockets on its way. 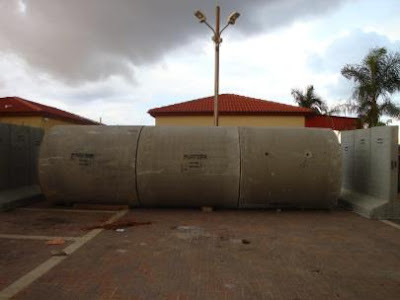 Sirens in Ashkelon and Ofakim. 9:33 PM Mortar fire reported over the Sha'ar HaNegev region. 9:30 PM 2,500 more reservists called up. 9:25 PM The rockets that landed in Be'er Sheva were Grad/Katuyshas. One hit an empty kindergarten. 9:22PM 3 rockets fall in Be'er Sheva. No injuries reported. 7:47 PM IDF angrily reacts to Defense Ministry recommendation (from the French Foreign Minister Berner Kushner...how shocking) for a "48 hour cease fire". 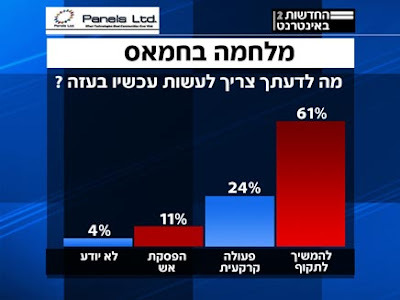 7:43 PM Channel 2 (Israel) TV Polled Israelis: What needs to be done now in Gaza? 7:00 PM Palestinian Girl places blame for the war fully on Hamas. 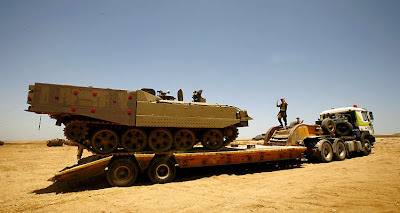 "The IDF Spokesman's Unit denied Tuesday's media reports suggesting the defense establishment recommended the National Security Cabinet explore a ceasefire in Gaza. "These statements are untrue and were not corroborated prior to their publication," said the military." This goes hand in hand with the report below that the IDF is chastising Israel's media for attempting to dictate IDF military action. 6:43 PM Massive air strike on the Philadelphia strip at this moment. 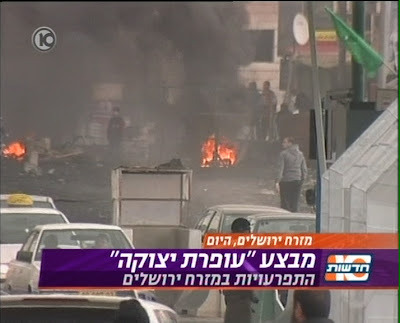 6:35 PM YNET reports that Hamas has rejects a 48 hour cease-fire proposal by Israel. Hamas: "We will hold fire only when it suits us"
6:31 PM Rockets land in Ashdod, Ashkelon and Netivot. No injuries reported. IAF starts another bombing run on Gaza. 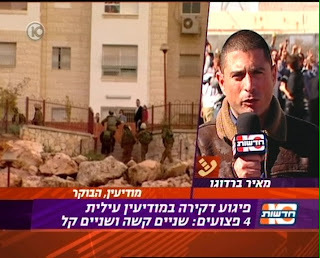 IDF critically states that Israel's TV channels are attempting to dictate IDF policy. 6:00 PM There will be a short break in coverage as we move to our next undisclosedsed location. 5:29 PM IDF YouTube channel showing hits on rocket launchers. 5:10 PM A total of 7 rockets launched in the last hour. 3 near Ashkelon, 1 S'derot, 3 near Gaza. 5:03 PM Two rockets land in open areas in the Eshkol region. 4:51 PM 3 year old child injured by stone thrown near the Zif Junction near Hevron. 4:46 PM More sirens going off in Sderot. 4:26 PM A female soldier was attacked near the Huwara junction by Schem. No injuries reported. 4:24 PM More sirens in Ashdod. 4:17 PM Rocket lands in the "Big" mall in Kastina near Kiryat Malachi, reports of injuries. 4:08 PM The range of various rockets and what they can hit. 4:04 PM 4 rocket launchers and a truck transporting Grad/Katyusha rockets struck by Air Force. 4:02 PM Rockets also near Kiryat Gat. 3:54 PM Reports that IAF has hit more then 95% of their targets. 3:41 PM Rockets in Be'er Sheva area. 3:40 PM Long range rockets fired over the Lachish Region, sirens in Kiryat Malachi. 3:31 PM A total of 14 rockets fired from Gaza today. 3:29 PM Rocket lands south of Rahat. 3:17 PM Army radio reports that it seems the Air Force is out of targets to hit. 3:15 PM Sirens in S'derot, explosions reported. More information as it comes in. Update: House of Chabad representative hit, he and family are currently in Kfar Chabad. 2:37 PM Terrorist stopped with explosive device at the Beit Iva checkpoint. 2:36 PM Motorist injured from rock attack near the Yitzhar settlement. 2:20 PM Rocket lands in the Western Negev. No injuries. 1:36 PM Critically wounded Palestinians from Gaza being transported to Egypt for treatment. 1:31 PM Arab rioter at Kalandia checkpoint shot while throwing Molotov Cocktail, in serious condition. 1:26 PM Rockets land in Western Negev region, no injuries. 1:08 PM More sirens heard in S'derot. 12:52 PM From one mission to the next. F-16 pilots returning from missions over Gaza, instead of taking time off are spending their time in S'derot and Netivot distributing toys to children in bunkers. 12:46 PM Czech FM has also set the blame directly on the shoulders of Hamas, claiming that their firing of rockets is unacceptable. The Czech republic takes over as President of the EU on Thursday. 12:42 PM Tanks have been used for the first time in the conflict, opening fire on targets in the strip. 1 2:21 PM Al-Jazeera are reporting a total of 380 killed and 1700 wounded. 12:12 PM 1 lightly wounded, 2 suffering shock from 3 rockets in S'derot. 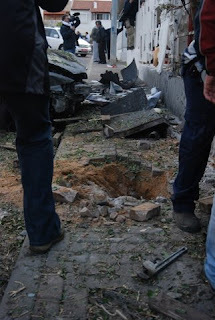 One of the rockets hit the house of a firefighter who was out on call. His pet dog was wounded seriously. 12:11 PM Hamas denies any contact with Senegal about a cease fires. 12:03 PM Israel spreading pamphlets to residents of Rafiach in Gaza to leave their houses. 11:49 AM A house hit in S'derot. No reports of injuries. 1. Cease fire - Hamas forced to request a cease fire. 2. Continuation of airborne attacks - Though there is a lack of targets. He is recommending the third option even though it will end in more casualties. 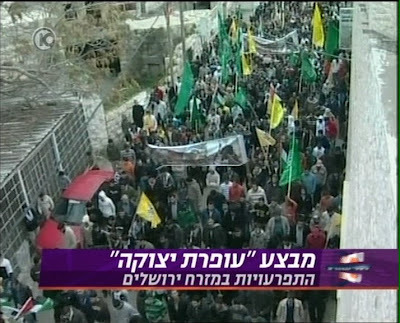 The goals are to return to a cease fire, return to negotiations and the return of Gilad Shalit. 11:09 AM Corrections services vehicle stoned on the 443 road near the Ofer Prison. 11:04 AM The funeral of Irit Shitrit will take place at 2:00 PM in the Ashdod Cemetery. Staff-Sgt. Lutfi Nasraldin will be buried at 3:00 PM in the Usafiah military cemetery. 10:33 AM A number of explosions heard in Gaza, reports of a car hit. Reports of 1 killed and two wounded. 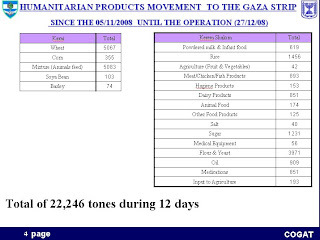 10:20 AM Israel moving 100 trucks of humanitarian aid into Gaza. 10:19 AM "Color Red" alarm sounded in Ashdod. 10:01 AM Names of those killed in last nights attacks released. Staff Sergant Lutfi Nasraldin from Galil village Dalyat el Carmel and Irit Shitrit from Ashdod. 9:32 AM Boats trying to deliver aid to Gaza have been turned back by Israeli Naval forces. 9:20 AM 107 Arab rioters arrested so far since the beginning of the Cast Lead operation. 94 are still in custody. 9:18 AM IDF forces hit rocket launch sites near Chan Yunis. 9:00 AM Schools within 30 Kilometers of Gaza border have been ordered closed today (their has been no school this past week for the Chanukah holiday). 8:30 AM The Consulate General of Israel in York will be holding an online press conference today on Tuesday on Twitter, at http://www.twitter.com/IsraelConsulate between 1 p.m. and 3 p.m. New York time. ISM/Anarchist's ship carrying unknown cargo attempting to enter the Gaza war zone was just stopped. ISM reports that their ship was rammed by IDF navy. IDF overrode the signal on Hamas radio this morning and warned all Gaza residents to stay away from ammunition bunkers as they will be blown up today. 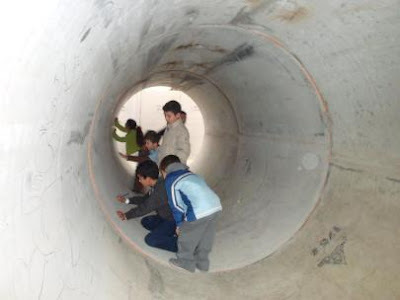 Rockets hit Ofakim and Yavneh. 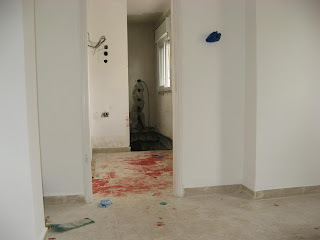 House in Ofakim hit. Terrorist shoot at Border Policeman in Jerusalem. No injuries reported. Stone throwing on 443 near Atarot. 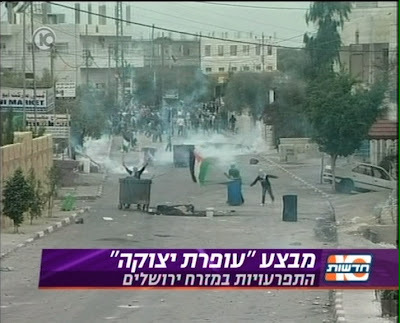 IDF dispersed the throwers. I was just there, but didn't see any signs of violence, though there were a lot of stones on the highway Monday morning. 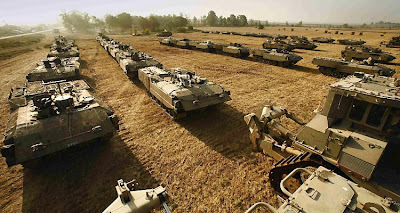 Carmella Menashe of Israel Radio is reporting that IDF ground troops have begun entering Gaza at around midnight. No secondary sources are confirming/reporting this. Second time that this report has gone out in the past 6 hours. Terrorist attack in Kedumim. Israeli man stabbed in the head by Palestinian. Molotov cocktail was hurled at the back entrance of the Hadassah Mount Scopus Hospital in Jerusalem. 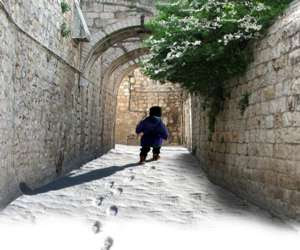 Jerusalem Municipality offering major discounts to Southern residents on shows and hotels for those visiting the capital. While our esteemed wafflemaster catches some much needed sleep I want to let you know that I have been putting together a round up of posts and news about Gaza. It should serve as a good resource in addition to the valuable news you are receiving here. Many of you are visiting us at the Muqata blog in search of more information on Israel's current war with Hamas/Gaza. Some (perhaps all) of you may be interested in how you can help the people of Israel. Cross-posting here in the hopes some of you can forward this to your people in the SF Bay Area. Israel is taking care of business in Gaza, and it is upon us to watch her back, here, on the streets of San Francisco. As we have seen from recent events in the region, PR war is a big part of this conflict, and "the streets" is where it’s fought, and no one will fight it but us. Under the camouflage of "Peace Movement", the haters and the misguided will be holding a demonstration in front of the Israeli Consulate to protest the "Holocaust in Gaza". We ask, where were they for 3 years to "stand for peace" when Israelis were being bombed, killed and injured? We ask why are the fair-minded supporters of Palestinians not outraged by Hamas’s continuous provocations which clearly led to this defensive action, by its human shields tactics, and by its complete disregard for human life, both Israeli and Palestinian? We ask, what would United States, Turkey, Russia or China do, if 750,000 of its citizens were under constant cross-border shelling? We ask the questions that are at the heart of this conflict, the ones that no-one will ask if we are not there! So be there, with your own questions and answers, and flags and energy, to show by our solid presence our unwavering solidarity with the Jewish State. These posters are ready to send to your local printer. Please bring your own flags and signs, we have limited resources for this event. Be the San Francisco Voice for Israel! 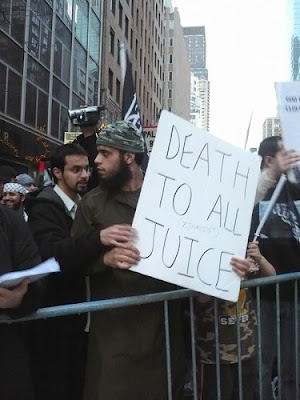 As always, feel free to make your own signs but please no signs or graphics offensive to any racial or ethnic group including but not limited to Arabs, Islam, or Palestinians. Signs in violation of our policies will not be allowed. 11:47 PM Good night. This concludes today's liveblogging coverage from the Muqata staff. Sending condolecnes to the families of those who died today, and a speedy recovery to Israel's wounded civilians. 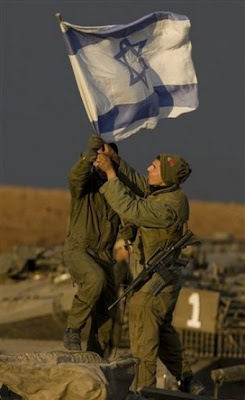 Wishing success and safety to our IDF soldiers, and hoping that the outcome of this war is a safer Israel. Hoping to return to liveblogging early Tuesday morning. 11:45 PM Another rocket falls in the vicinity of Netivot. No reports of injuries or damage. 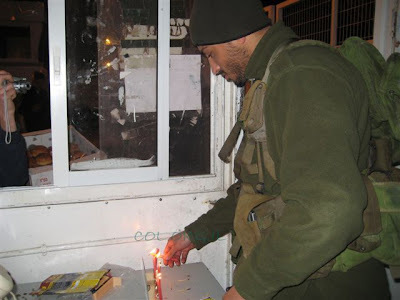 11:43 PM An IDF Soldier's mother collects her thoughts on her son serving in the war. I echo her sentiments, precisely. 11:39 PM Color Red warning in Sederot. 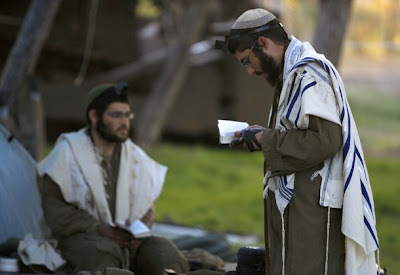 Belz and Gur Hasidic Yeshivas relocate their students from Ashdod to the center of Israel due to the ongoing rocket strikes in Ashdod. 11:34 PM Two Israelis wounded (1 light, 1 moderate) in Ofakim from 3 rocket strikes. 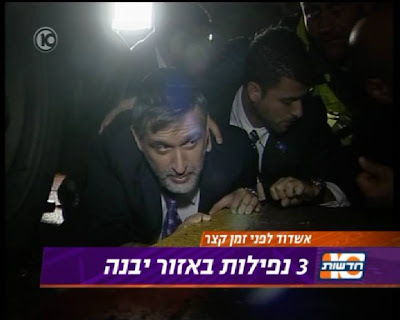 11:19 PM Israel Government Minister Eli Yishai (Shas) scrambles to the ground for cover during Ashdod rocekt attack this evening. 11:06 PM Two Rockets fall in the vicinity of Yavneh, reports of a rocket in Kiryat Gat area as well. 11:01 PM AirRaid Sirens in Ashdod and Ashkelon. 11:00 PM Updated status on casualties (10:48 report) 3 Israelis killed today by Gaza rockets. 10:53 PM IAF launches fresh air assault on Gaza targets. 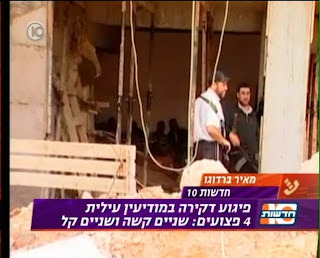 10:48 PM Channel 1 Israel TV reports that 3 people were killed in from Katyusha attacks against Israel today. 1 in Ashdod, 1 in Ashkelon, 1 in Nachal Oz. 10:26 PM No reports of rockets in the second Ashdod alert tonight. 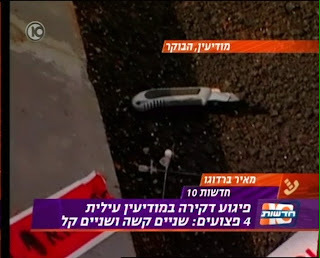 10:24 PM 6 wounded, 1 killed by rocket attack in the Nachal Oz area. 10:19 PM Air Raid sirens again in Ashdod. Color Red Warning system in Sederot. Molotov Cocktail thrown at Hadassah hospital in Jerusalem. No injuries or damage in the firebomb attack. 9:42 PM Additional 2-3 wounded in Ashkelon rocket attack. 9:36 PM Reports of 2 seriously wounded in Ashdod rocket attack, and 15 with minor injuries. 9:35 PM MDA transporting 1 wounded person from a stabbing terror attack in Kedumim. 9:30 PM Initial reports of 2 wounded in Ashdod rocket attack. 9:03 PM Israel's Channel 10 TV reports a massive explosion in Northern Gaza. 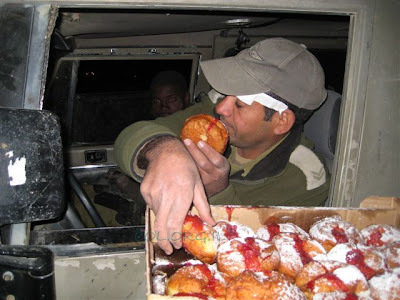 9:02 PM IDF decides it wasn't gunfire at their jeep, but rock throwing. 8:38 PM Shooting at IDF jeep in the Shomron (West Bank) between Revava and Ariel. No injuries. 8:22 PM Al-Jazeera reports that since Saturday, IDF forces have killed over 350 Palestinians in Gaza, and wounded 1600. Today alone, 35 were killed and 250 wounded. 8:18 PM In a rather odd broadcast, Israel's channel 10 TV news discloses that the 2 brigades scheduled to fight in Gaza are Givati and Tzanchanim (paratrooper). 8:16 PM Hamas TV once again off-air. Only a black screen can be seen in their broadcast. 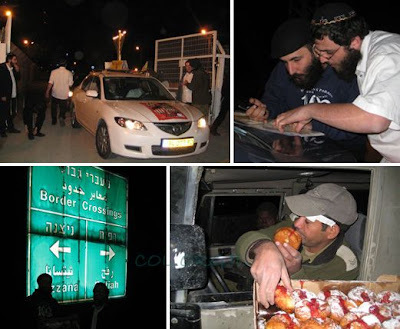 8:12 PM Photos from last night at the Gaza Border crossing, as Chabad-Lubavitch representatives bring jelly donuts to soldiers and light Chanuka candles. 8:04 PM At 7:48, Gaza launches rockets toward Sederot. 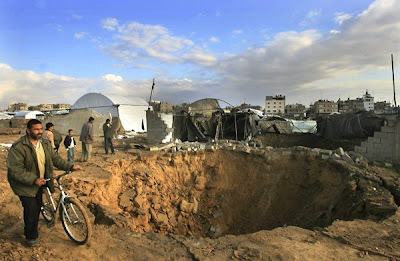 Shells misfire and land in Hamas-controlled Gaza. 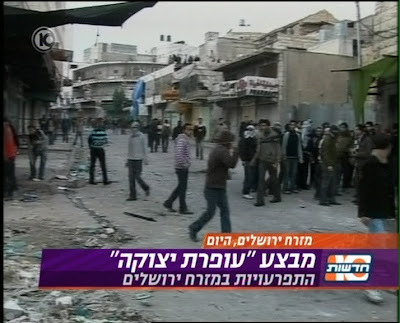 Channel 2 Israel TV reports that in their opinion, the ground assault will begin tonight. Will Injustice be served on Shabbat?